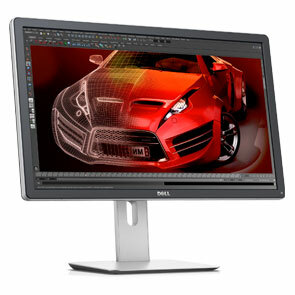 Dell announced a new 23.8-inch monitor model that focuses primarily on the number of professional users of 3D-animators, digital artists, and designers. The product boasts an impressive resolution Ultra HD, which is 3840 x 2160 pixels. The rest of the specifications and appearance are also at a high level. The display is made by technology IPS, as already mentioned above, the resolution is 3840 x 2160 pixels, diagonal - 23.8 inches. This forms a density of 185 pixels per inch. The value of the model and the dynamic contrast ratio is equal to respectively 1000: 1 and 2 000 000: 1, brightness - 350 cd / m², viewing angles horizontally and vertically reach 178 degrees, and the response time of the matrix - 8 ms. Provides 99 percent coverage of Adobe RGB color space, and a 100 percent - sRGB. To connect is a solid set of interfaces. It is HDMI 1.4, DisplayPort, Mini DisplayPort, four-port hub is USB 3.0, and a universal card reader. Menu is clear and user-friendly, with a lot of options. Among these preset modes of color temperature (5000K and 10,0000K) and color space (Adobe RGB, sRGB, and two manual presets). There is also a ready mode "multimedia", "cinema", "Game" and "books."